A confluence of three events lead to this book. Imagine that you have decided to create a private ADR (alternative dispute resolution) practice. How would you go about getting work and building business? The small groups took their markers and flipcharts and disappeared for 45 minutes. As I paused at the doors of the breakout rooms in which they worked, I could see earnest and diligent conversation unfolding, words appearing on paper. These were groups of smart adult students who came to grad school often on the heels of successful careers in other arenas. The small groups returned and hung their lists on walls around the room. My eyes skimmed the posters. I was sure I’d missed something that surely had to be there. I skimmed them again. Find out if my state’s Postal Service roster is accepting new mediators. Contact the courts to find out what mediation panels are recruiting mediators. Contact my state’s child welfare agencies about child guardianship and permanency adoption programs. Call my local community mediation centers and volunteer in order to build my portfolio. Every approach sought to acquire work from a program that already existed and was run by someone else. Noticeably absent were any practice-building or client-generating strategies to be conducted by these mediators on their own behalf. By the time I attended a regional ADR conference about a month later, I had mused quite a bit about that first day of class. Was such thinking somehow limited to our grad students, I wondered, or was their thinking typical of others in the field? At the conference, I made a point of asking my fellow mediators a version of the same question: Where do you turn to catch new waves of opportunity for building your ADR practice? My anecdotal, informal research yielded responses that were uncannily similar and now too familiar … it wasn’t just my grad students. I was considering Bernard Mayer’s Beyond Neutrality: Confronting the Crisis in Conflict Resolution as a text for one of my upcoming classes and began rereading it soon after the conference. But this time, I read with those two experiences rattling about in my brain. In his important book, Mayer paints a compelling portrait of a field in danger of stalled development. He makes a strong case that ours is still primarily a supply-driven field that hasn’t successfully engaged the public’s ongoing interest or consciousness. Mayer points out, rightly so, that we haven’t been meaningfully included in some of the most important conflicts of our time and are too frequently left on the outside of conflicts, even in our own communities. Mayer has suggested that the developmental crisis isn’t so much the result of inadequate marketing as of practitioners’ failure, as a whole, to offer our skills and talents in services that are truly compelling to the public. As I considered Mayer’s words in light of recent conversations with my grad students and fellow conference-goers, I realized that ADR’s developmental crisis is much more closely associated to inadequate marketing than Mayer suggests. Many mediators I’ve met are hesitant marketers. If you were drawn to Making Mediation Your Day Job, you may be among them. The field is struggling, in part, because many of its professionals aren’t yet building healthy individual practices by using leading-edge approaches already well utilized in other successful service fields. When I discuss marketing with mediators, I notice a dislike of “selling myself” and a hesitation to use online technology for creating real leverage. Out-of-date marketing methods—or worse, little real marketing at all—result in a public that’s woefully unfamiliar with how you can help. More important, truly effective marketing, in today’s terms, means that you learn from your market and adjust your services accordingly. When you engage your market in a two-way conversation, you listen and learn. You give yourself the opportunity to really understand what they want and in what form. In other words, when you market well, you address Mayer’s concerns about over-reliance on resolution and neutrality, because your market will tell you what they want and need. If you mediate because you want to help people navigate conflict more successfully, how do you know that Mediation (the formal process) is the best way to deliver on your purpose? When you engage in dialogue fully, you open yourself to new information that may well change how you do what you do. Around the same time, I noticed an increase in the number of calls and e-mails I was receiving from my fellow mediators. As I talked with mediators from around the United States, I started to see a pattern in the challenges most of them faced. Many approached marketing with distaste. Few were truly comfortable with the online environment and the ways they could leverage it to help build their practices. Even fewer seemed to have laid a solid foundation for launching their marketing strategies … if they even had a marketing strategy. It wasn’t, I realized, anything to do with intelligence or business savvy. It seemed to be associated with an outmoded way of looking at marketing. Why are many mediators looking for work primarily through opportunities someone else has created? Perhaps mediators who tried to build business and found very few clients coming through the door believe the chance for any work at all is better than spinning private-practice wheels. The trouble is, of course, that only a few mediators make a real living through rosters and panels, and the more who want in, the less work there is for all involved. The pay scale of most rosters also makes it difficult to thrive. Why aren’t mediators tuning into real market needs and capitalizing on them? It is as though the real opportunities are somehow invisible. Perhaps the idea of creating something new feels daunting, or perhaps new mediators want the credibility and legitimacy that panel affiliations seem to give them. Yet the time and effort they put into these affiliations drains from time to successfully build a practice that’s independent of such affiliation. How can more mediators experience the synergy of thinking like an entrepreneur? Is it possible that some mediators dislike marketing so much that they prefer to rely on already-existing programs to send them a thin trickle of work? If this is true, then it’s not surprising that so many mediators can more rightly call their work a hobby than a business. How can those of us who educate and train mediators do a better job of helping our participants and graduates step outside the limiting confines of community, government, and court-based programs? This seems especially important if we are to address increasingly vocal criticism about turning more mediators loose in a field that has too many mediators still trying to make a living by mediating. This book is my response to these questions. It’s written for mediators with a passion for helping people successfully navigate conflict, but with considerably less passion for marketing. It’s written to create the foundation needed in order to use online marketing strategies effectively. It’s the kind of manual I wish I’d had when I founded my practice over a decade ago, and the kind that mediators I teach and work with today tell me they want. Stop putting most of your effort into applications to ADR panels and rosters. You are not likely to earn enough from these positions, because there are not enough of them for all the professionals who want to make mediation their day job and panel-obtained mediations do not tend to pay sufficiently for a mediator to live on. Stop banking on a living wage from state agency referrals and rosters. Even in states with healthy mediation programs associated with government agencies, there will not be enough work to pay you and all the other mediators clamoring for a piece of the pie. Stop giving most of the time you have available to develop your practice to your community mediation center in the name of getting experience. Give them some of your time, as community mediation centers play an important role, but keep a significant portion of your time for serious development of your practice. Stop waiting for referrals from lawyers. Many attorneys like to refer ADR work to other attorneys because that’s the dispute resolution world they know best. Even if you’re an attorney, it’s going to take a long time to build a full-time practice that way. Stop waiting for your national, regional, and state associations to educate the public and create work for you. Most of our associations don’t have enough person-power or fiscal resources to make this a reality any time soon. And it’s debatable whether that should even be their job. If you’re doing much of the above, you’re doing what I call “Field of Dreams marketing”: build it, and hope they will come. Stop waiting for someone else. Start creating your own reality, in just the way you expect your mediation clients to take responsibility for their own lives, behaviors, and decisions. You can make the commitment to start right now. When I founded my full-time private practice in 1997, I had no prior entrepreneurial experience and wasn’t particularly savvy about business ownership. I was a college vice president at the time, and though I had lots of experience managing people, managing large budgets, and administering a decentralized organization (not to mention lots of experience as an “insider” mediator), I had never thought of myself as an entrepreneur or businessperson. I became a business owner because I wanted, more than anything, to make mediation my day job. When I began educating myself about marketing and building a business, I initially felt overwhelmed and turned off by some of the counsel I received. Business development advisors told me I’d need to invest in advertising, schmooze a great deal at business networking events, and learn how to be a good salesperson. Several advised me to master the art of cold calling. It was that latter piece of advice that prompted me to sit in my shiny new office one afternoon, blue as can be. I knew that if I had to do many of these tasks, I’d fail. It just wasn’t me, and I wasn’t interested in transforming myself into someone who could do those tasks. I knew that if I had to cold call people and try to convince them I had something they really needed, I’d never do it. I knew that if I followed the ABCs of sales, “Always be closing,” I’d feel like a fraud. I realized that if I had to do many of the things traditionally associated with marketing and sales, I simply wouldn’t do them, and my business would flounder before it ever gained real traction. I’m not one for hovering long in powerless places or giving up easily on a dream. So I decided to do something different than what I had been advised. I decided to market my ADR practice based on my strengths and the kinds of tasks I enjoy. This book is about the simple and effective system I developed from studying, experimenting, and thinking about marketing from the mediator’s chair. It’s a book that I hope will change the way you think about the business of mediation, help you find your footing in the field, and inspire you to think of practice development in ways that build instead of sap your energy. It’s a book about building on what you already know and value in order to do the work you love. You have, no doubt, noticed that I use the phrase “making mediation your day job,” not “making ADR your day job.” Mediation is used in the literature of our field to refer to a specific dispute resolution process that carries certain elements distinguishing it from other processes such as arbitration, facilitation, negotiation, neutral evaluation, and the like. In my classroom, I would call this—with a generous nod to Jennifer Beer and Eileen Stief—big “M” mediation. For this book, I have chosen “mediation” for its small “m” connotation, one that I fear is getting lost in the adjunctification of mediation to the legal field. Small “m” mediation encompasses the myriad distinguishable formal processes that bring a mediative influence on conflict. You will notice, as you read on, that I do not use “attorney-mediator” and “non-attorney-mediator” terminology in the book. Each is a problematic phrase and contributes to public confusion that further hobbles the development of the field. I invite you to stop using these terms, too. The term “attorney-mediator” suggests that the two professional roles are performed simultaneously or that one is necessarily an adjunct of the other. Either interpretation risks a conclusion by an ill-informed public that the two go hand-in-hand. Such a suggestion fails to honor the historical roots of this field and the significant number of excellent mediators who hail from other professional backgrounds. Adopting “attorney-mediator” language necessitates other hybrids in order to be inclusive and fairly acknowledge the rich diversity of backgrounds: therapist-mediator, educator-mediator, social-worker-mediator, physician-mediator. The list would become exhausting before it could become exhaustive and would drift into the ridiculous: horse-trainer-mediator, massage-therapist-mediator and so on. The term “non-attorney-mediator” is at best confusing and at worst insulting. It defines mediators who have degrees other than a J.D. by the absence of attorney-ness. It is the equivalent of referring to African Americans, Native Americans, Latin Americans, and others who are not Caucasian by the term “non-White.” No one should be defined by what they are not. “Non-attorney-mediator” is a marginalizing term and, accordingly, has no place in our field. Instead, I have chosen to use the term “professional mediator,” which is not without deficiencies of its own. It’s a term I chose to embrace all mediators who wish to make mediation their day job, regardless of profession of origin, academic degree, and preparatory history. You could read this book in a single evening, but I hope you won’t. It’s designed to be concise and more like a pocket guide than a tome of wisdom. It’s formatted with each major point creating its own section so that you have space for notes and can find an idea again quickly. But its length and formatting has nothing to do with encouraging speed-reading. Instead, I hope its brevity and layout encourages you to take your time and know that you can move through it with care because you won’t be overwhelmed with complexity or wordiness. Much of the book is designed to be interactive. To get the most from it, I invite you to engage the book instead of simply reading it. We know from the latest learning research conducted by neuropsychologists that actively engaging reading material significantly improves retention and the ability to apply it. Engage it by jotting notes in the white space I’ve provided. By flagging (with sticky notes or sticky tabs, for instance) pages you want to return to for further reflection. By jotting down your questions or insights on those sticky notes. This book is of little use to you if you don’t apply it to your practice. With this in mind, I’ve crafted most chapters to close with reflective questions that tease out your thinking and begin the process of applying my system to your own mediation practice. I recommend that you create a computer file or purchase a journal-style notebook just for the purpose of working through this book. In so doing, you’ll create a special place for your practice-building efforts to take shape, which will hold your hopes and dreams for the work you love. By taking the time to write down your responses to the reflective questions, you’ll begin building momentum in your marketing efforts, and you’ll have the physical evidence of that momentum right in front of your eyes. The exercises are designed to build on one another and create direction and momentum for you over time. Some exercises will take fewer than five minutes; others may be ones you ponder for several days before completing. I encourage you to take the time you need to flesh out your thinking in an exercise. It’s likely you’ll return to some exercises to refine over time. 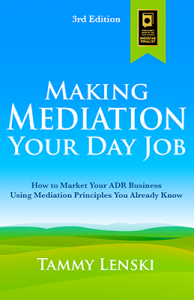 Are you ready to make mediation your day job? Copyright © 2008 by Tammy Lenski. All rights reserved.